Cities can be stifling. Even Los Angeles. Though it’s not full of skyscrapers like its East Coast counterpart, LA’s traffic-packed grid of streets and chaotic population can become a bit overwhelming at times. Sometimes you just need a nice, peaceful park to remind you that it’s not all police sirens and honking horns. If that’s the case, take a break in one of these 10 green spaces in and around Los Angeles. The go-to park for many Los Angelenos, Griffith Park stands as one of the largest urban parks in North America. At 4,310 acres, the park is situated on the Eastern Santa Monica Mountains range, making it the perfect spot for a good hike. No path is off limits, and hikers can use all 53 miles of trails and roads in the park. Griffith also features plenty of open areas for recreational sports and picnicking, plus a swimming pool, tennis courts, an equestrian center, and a golf course. But, of course, the park is most well known for Griffith Observatory, the planetarium and museum center that sits atop the hill, looking out over the rest of the city. Located in the heart of LA, Runyon Canyon Parksits just off Highway 101 on the famous Mulholland Drive. The 160-acre park is a common place to spot celebrities, but it’s better known for its relaxed pet policy — dogs are allowed to roam off-leash in the majority of the park. A sloping, paved road leads from the park grounds to the depths of Hollywood, offering magnificent views of the LA Basin and the Hollywood sign. Hikers will be happy with Runyon as well — Indian Rock is its highest peak at 1,320 feet (402 meters). LA’s oldest park isn’t as well-kempt as some of the others on this list, but it does offer beautiful views of DTLA, the Hollywood HIlls, Dodger Stadium, and the Los Angeles Valley. With several baseball fields, playgrounds, and dog-friendly spaces, Elysian is a great place for anyone looking for somewhere a little less crowded than Griffith. There are plenty of dirt trails for runners and hikers, too. Just remember that if you hear gunshots, it’s okay — the Police Academy is just below the hill, and the sound comes from firing practice. Anyone who loves architecture (or just wants a scenic spot to relax in) should head to Barnsdall Art Park. This hillside space in Los Feliz centers around Hollyhock House, a structure designed by none other than Frank Lloyd Wright. Today, the facilities house art centers and galleries, and the summer sees outdoor theatre, wine-tasting, and various festivals. The park’s steep staircase was also recently used as an important filming location for “Big Little Lies” — fans will know which scene I’m talking about! Located in the middle of the city, Barnsdall is a great place to spend a few hours spread out on the lawn with a good book. 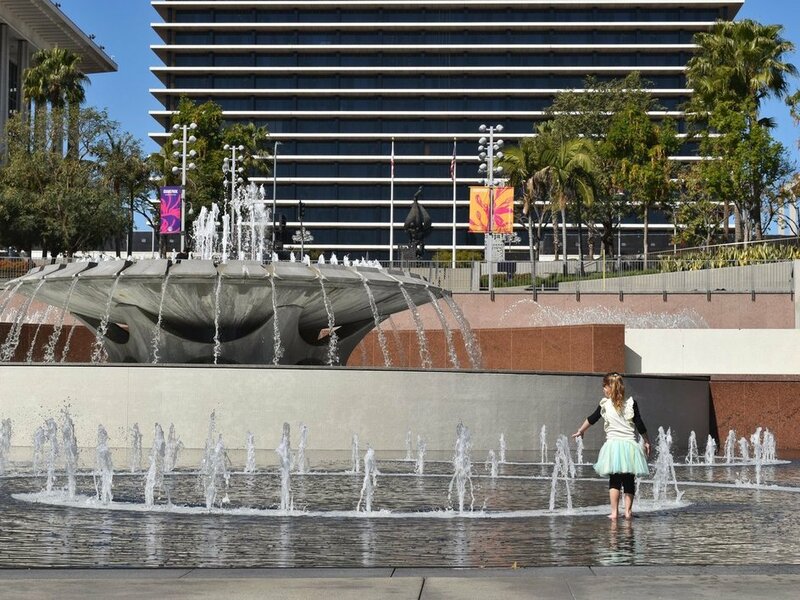 The self-proclaimed “park for everyone,” Grand Park is a 12-acre haven in the middle of LA’s industrial downtown area. Opened in 2012, it features fountains, tree-shaded lawns, movable furniture, and recreational sports areas. The public space is used for events throughout the year but is most popular during the summer, when there’s a full calendar of festivals, concerts, and other fun activities. If you need a break from the “city” side of LA, just skip on over to Grand Park. Though not technically a park, UCLA’s Westwood campus is a great spot for anyone looking for a gorgeous setting for a late-afternoon or early evening walk. The warm, brown-brick buildings that line every quad, combined with the fading light that peeks through the many trees, make for the loveliest of settings. Bring a book, a blanket, and maybe a snack or a drink — with the sounds of college students moving about their days, this campus is the perfect spot to relax. You might just forget you’re in Los Angeles at all. This historic park on the Eastside recently underwent a huge renovation, and the results are fantastic. With a view of the downtown skyline visible through the teetering palm trees, the park encourages visitors to pedal around its lake, walk or jog along its circular path, and throw down a blanket or string up a hammock in one of its many shaded areas. In short, Echo Park Lake is the perfect afternoon retreat. Plus, from June to September, the area blooms with thousands of lotus flowers! Those who want a bit more of an educational green space should look no further than Exposition Park. Located across from USC, this museum-lined park’s crowning glory is its gorgeous rose garden. Once you’ve soaked up the garden’s fragrant blooms, head into one of the red-brick museums nearby — the California African American Museum and California Science Center are free, but the Natural History Museum is fairly cheap as well! If you’re up for a bit of a drive, make your way to the Huntington Library and Botanical Gardens in San Marino. Not only is the library a sight to behold, but the gardens are a treat in and of themselves. Take a leisurely stroll through some of its 120 acres, which are divided by theme for your viewing pleasure — some of which include a cacti-packed Desert Garden, a stately Shakespeare Garden, an entertaining Children’s Garden, a quiet Japanese Garden, and a delicate Chinese Garden. Given its size, you’ll likely be back to explore soon after your first visit. For an open space as wide as Griffith, but without the tourists, head to Kenneth Hahn State Recreation Area on the Westside. This sprawling park features over seven miles of trails, a pond, a fishing lake, sand volleyball courts, and views of the LA Basin. It’s the perfect spot if you’re in need of a getaway.